The Chartists in Britain had first raised the question of a general strike. A pamphlet published by William Benbow — A Grand National Holiday and Congress of the Productive Class — was published in 1832 and widely circulated. Benbow was a printer and publisher who served at least two terms of imprisonment as a result of his fight for the productive class’. His pamphlet called for the fixing of a ‘holy’ or ‘sacred’ month, in which all work would cease. The conception that, if the Charter was refused then working men and women should stop work, set up their own Convention or Parliament and somehow proceed to change society, was widely diffused throughout the Chartist Movement. It was held by both ‘physical’ and moral forcists’. Moral forcists’ advocated the ‘holy month’ as an alternative to ‘physical force’ believing it would lead to a collapse of opposition. George Julian Harney, one of the leaders of the ‘physical force’ majority, attacked the cloudy conception of the ‘holy month’. He poured scorn on those who thought the general strike would be a peaceable economic weapon and declared that, on the contrary, it would mean insurrection. He was not opposed to insurrection but he objected that those who supported the ‘holy month’ so strongly, at the same time denounced the arming of the people. This time, however, it was not the working man who wished to close their mills ad send the operatives into the country parishes upon the property of the aristocracy, thus forcing theTory Parliament and the Tory Ministry to repeal the Corn Laws They were drawn into this revolt without wishing it - - - If it had been from the beginning an international, deter_mined working mans insurrection, it surely would have carried its point, but these crowds, who had been driven into the sweets against their own will, and with no definite purpose could do nothing. In the First International Marx and Engels fought and defeated the anarchist policy on the general strike. Bakunin was for the end of capitalism by one big action. A general strike was to be the quickest way to leap into a new society. In Bakunists at work, Engels exposes the anarchist’s activities in the 1873 uprising in Spain. They led the First International in Barcelona and they lost all influence among the workers who laughed at their demand for a general strike. Engels quotes from the posters they issued: Workers: we are conducting a general strike to show the abhorrence we feel when we see how the government is using the army to fight against our fellow workers. When, instead of calling to arms, they declared a general strike, ‘they became nothing short of contemptible in the eyes of workers.’ Marx and Engels fought the theory of Bakunin and his followers which took no account of objective circumstances and was rooted in the petty bourgeois consciousness of the dying handicraft and artisan class. They posed a turn towards the development of the proletariat and to day-to-day political work. Their arguments against the anarchists were carried in a one-sided way into the conflicts in the German Social Democratic Party at the turn of the century. They were distorted and used by the reformists. They were carried beyond their historical limits in order to justify repudiation of revolutionary methods and concentration on Parliamentary tactics. Luxemburg asserted: ‘In reality the mass strike does not produce the revolution, but the revolution produces the mass strike.’ In attacking those who saw the peaceful parliamentary road as the essence of development, she began with world relations. She assailed the opportunists and reformists who treated the mass struggles in Russia as purely Russian phenomena. She was at one with Trotsky’s later writings on the significance of the Russian Revolution in world capitalist development. The German workers should look upon the Russian revolution as their own affair: ‘first and foremost as a chapter in their own social and political history . . the Russian Revolution is a reflex of the power and maturity of the international and, in the first place, of the German, labour movement’. It would, therefore, be a too pitiable and grotesquely insignificant result of the Russian Revolution if the German proletariat should merely draw from it the lesson — as is desired by Comrades Frohme, Elm and others — of using the extreme form of the struggle, the mass strike, and so weaken themselves as to be merely a reserve force in the event of the withdrawal of the parliamentary vote, and, therefore, a passive means of parliamentary defensive. …the mere defensive can never exhaust the policy of the proletariat in a period of revolution…it is absolutely certain that when we in Germany enter upon the period of stormy mass action it will be impossible for the Social Democrats to base their tactics upon a mere Parliamentary defensive. To fix beforehand the cause and the moment from and in which the mass strikes in Germany break out is not in the power of Social Democracy because it is not in its power to bring about historical situations by resolutions at party congresses. But what it can and must do is to make clear the political tendencies when they once appear and to formulate them as resolute and consistent tactics. In Britain, before the first world war, the question of the general strike came up again. Among the working class disillusionment with the collusion of the leaders of the new Labour Party with the Liberals, and disillusionment with trade union leaders who opposed workers’ struggles, led to a rapid growth of syndicalism. In the writings of James Connolly and Tom Mann it was the industrial union, the One Big Union of the working class, that would express the power of the workers at the point of production and by simultaneous action take over society. It would also provide the framework for the future workers’ republic. Thus up to the time of the First World War the general strike had come up as a once-for-all final solution in face of which opposition forces, including the state, somehow collapsed; it had also come up as a reserve weapon to defend reforms. We should add, that in respect of the Chartist ‘Holy Month’, it must not be forgotten that this was the idea of a newly-born working class making its experience of capitalist society, and of its own class nature. It was before scientific socialist consciousness could be brought to it; it could not but have unclear conceptions of its own struggles. The later ideas of the Bakunists, which sprang from the consciousness of petty proprietors, were completely reactionary. The best of the syndicalists in Britain took up the experience of the Russian Revolution and fought through to help form the Communist Party. In 1920 the threat of a general strike stopped the British government from intervening in the Russo-Polish war. This neither contradicts Trotsky in his remarks on the general strike as a threat not his remarks on the ILP slogan of a general strike against war. A British expeditionary force was still in north Russia when, afraid at the advance of the Red Army in Poland, the British government issued further threats against the workers’ state. A powerful ‘Hands off Russia’ movement had grown among the working class, spurred forward when London dockers in May, refused to load the Jolly George’ with munitions for Poland. The TUC in July voted for a general strike to end the war in the Soviet Union. But what gave content to its words was the reaction in the country when the government issued bellicose statements, prepared to move the Baltic fleet at the end of July and sent troops in to break a strike against the war by German workers in East Prussia. Several hundred local Councils of Action were formed. A meeting of the Parliamentary Committee of the TUC, the NEC of the Labour Party and the parliamentary Labour Party, warned the government that the whole industrial power of the organised workers would be used to defeat this war. A National Council of Action formed by the executives of trade unions and organisations affiliated to the Labour Party was called to arrange a general strike. Lloyd George, the Prime Minister, declared war had never been intended. Soon after British troops were withdrawn from Russia. Whatever might have been the ideas of individual leaders, as far as the masses supporting it were concerned, the general strike was not just a threat to be brought out like a ‘pocket knife’. It was action flowing from the entire preceding developments and revolutionary situation as Trotsky and Luxemburg discussed. The army was unreliable. It was not yet two years since the slaughter of World War I ended. Demobilisation, the slowness of which was source of great discontent, had not been completed. There was worldwide sympathy with the Russian Revolution; it had greatly inspired sections of the British working class. There was also opposition to the war in Ireland. 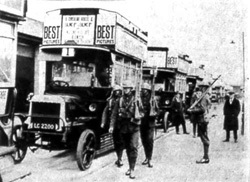 In this context the Government retreated before the movement to general strike. By 1926 the ruling class was prepared to face a wholesale confrontation with the working class. Indeed, they provoked it. In 1925 they postponed a struggle by granting a subsidy to maintain miners’ wag~ and then they planned for the confrontation during the following year. The TUC led by left-wingers’ made no preparations. The General Council was pushed reluctantly into support of the miners when they were locked out for refusing lower pay and longer hours. Mortally frightened by the movement that was unleashed, they bet, rayed it at the first opportunity. With their members in shattering defeat, once it was over, they rushed into abject class collaboration. The big question of the 1926 General Strike, is the question of leadership. The Communist International had begun to degenerate at that time. The Communist Party was led in an unprincipled way in an alliance with left’ trade union leaders. The independence of the Communist Party Was subordinated to this alliance. The party put forward the slogan of ‘All power to the General Council’ a slogan which had arisen out of the collapse of the Triple Alliance. It expressed a call for individual unions. With the obvious coming betrayal of the leaders the slogan only served to sow illusions. The Communist Party called for ‘power to the Councils of Action’ but failed to make an independent fight for leadership. The dangers in the Communist Party policy became ever clearer after the betrayal of the General Strike when the miners were left for seven months to struggle on their own. Trotsky called for a campaign to reopen the general strike, which meant an all out struggle against the leadership. He said it would be a great illusion to believe that an isolated strike of miners could achieve what the General Strike failed to achieve. To convert the economic strike into a political strike, meant war against the General Council. The Communist Party followed the ‘left’ leadership of the miners’ union in fighting the miners’ strike as an isolated battle. Proposals for a levy in support of the miners and an embargo on coal were sabotaged by labour and trade union leaders. With the agreement of the miners’ leaders, including the ‘left’ A.J. Cook as member of the Anglo- Russian Committee, a conference of trade union executives in June, where the General Council could have been brought to a reckoning, was postponed. The ‘June Pact’ was arrived at, by which there was to be no criticism from either side — the General Council or the miners — until the miners’ lockout was ended. The General Council promptly broke its pledge, to the delight of the mineowners. Cook refrained from attacking the General Council. The TUC in that year did not discuss the General Strike. Cook supported this. The overriding question posed by the 1926 General Strike is not only the recognition that the general strike must be a struggle for power. Today, many will pay verbal adherence to that. Important as that is, more important is the question of independent revolutionary leadership — the role of the revolutionary party. History showed that only through a revolutionary Marxist party could the working class take power. However, in Britain in 1926 it was Zinoviev’s conception that the British revolution could pass through the ‘broad gate’ of trade unions, without the Communist Party, and the opportunist preservation of the Anglo-Russian trade union committee as a bulwark for Soviet defence, which led to the false position of the Communist Party. It was this which led the CP to dissolve its independence into a left opposition in the trade unions. It is true that the British trade unions may become a mighty lever of the proletarian revolution; they may, for instance, even replace workers’ soviets under certain conditions and for a certain time. They can, however, fill such a role not apart from a Communist Party and certainly not against the party, but only on the condition that communist influence becomes the decisive influence in the trade unions. When the General Strike was betrayed, Trotsky and the Left Opposition demanded that the Russian unions break with the General Council, with whom they sat on the Anglo-Russian Trade Union Committee. To maintain the Anglo-Russian Committee, they said, would only shield those who had betrayed, with the prestige of the Russian Revolution. The demand was rejected by Stalin. In July, at a meeting of the Anglo-Russian Committee the General Council forced the Russian unions to withdraw a statement criticising the sell out of the General Strike and refused to allow them to discuss how to aid the miners still locked out. The 1960-1961 general strike in Belgium brought forward again the lessons of the British General Strike. It further proved to be a salutory exposure of Pabloite revisionism, which had led to the split in the Fourth International in 1953. In the activities of Mandel and his group was shown the Pabloite liquidation of revolutionary leadership. The practice in Belgium flowed from Pabloite theory that bureaucracies could be moved in a revolutionary direction by pressure of the masses. Mandel — the self confessed author of the main revisionist document in 1953 — was editor of La Gauche weekly, recognised as the voice of the left wing of the Socialist Party. The paper was founded by Mandel and André Renard, a metal workers leader with a big personal following. Until his death in 1926, he dominated the socialist trade unions in Wallonia, the French speaking part of Belgium. On the editorial board of La Gauche were the MP for Charleroi and the secretary of the Liege trade unions. The strike began in December 1960 in protest at the ‘Single Law’ promulgated by the Christian Social-Liberal Coalition. It placed the burden of re-equipment and modernisation of capitalist Belgium upon the shoulders of the working class. It proposed an increase in purchase tax and reduction of public expenditure on national insurance, unemployment allowances and sickness benefit. A graphic picture of the strike is to be found in Tom Kemp’s reports from Belgium, published in the Newsletter (later to become Workers Press and then News Line) in January and February 1961. The reports were later published as a pamphlet by the Socialist Labour League under the title ‘Class Struggles in Belgium’. While the masses move, the leaders drag their heels — that seems to be the record of the movement That is not to say that leaders do not march at the head of demonstrations, appear on the picket line or make speeches before their followers They drag their heels in the sense that they do not raise positive slogans to direct the mass energies which have been evoked into a struggle for the overturn of the government. The Communist Party called for ‘pressure on the Christian social and Liberal deputies.’ The Stalinists were to the right of the Socialist leadership. And Mandel? As did the Communist Party in Britain in 1926, he operated a pressure group on left leaders. His call was for ‘structural reforms’; a free national health service, nationalisation of power industries, full employment and economic planning, control of the trusts, a halving of the military budget and a Public Investment Board. Given the back of an envelope and a pencil any left reformist would write out such a programme in two minutes. It was in line with the policy of the Socialist party. Mandel declared(6) that these ‘structural reforms’ were not minimum demands but transitional demands — that is demands which could only be realised through the conquest of power. Under the pressure of the strike, Parliament can be led to refuse the ‘Single Law’ and to take other laws into consideration. It is sufficient if the Social Christian MPs listen to the voice of their own electors, that they take up a position under pressure of the strike on their own mandates, for a new parliamentary majority to emerge at least on these two questions; withdrawal of the ‘Single Law’, vote of an outline law on tax reform and structural reforms. There we have a minimum programme dependant on Parliamentary action. The most significant indictment of Mandel’s policy comes from his own pen, in the letter which he wrote to Tom Kemp defending his policies. He lists seven important points in his line of thought’ on the strike. (7) They set the bounds within capitalism of Mandel’s perspective on the general strike. That leaves it exactly in line with the lefts. Point 2 reads: ‘That we should prevent above all this explosion only leading to some minor adjustments within the framework of capitalism and becoming a new “missed opportunity” for decisive blows against capitalism.’ Note: Not the overthrow, but decisive blows. That this was the axis of his policy, we can see from the way his last point deals with the 1892 Belgian general strike which won an extension of the suffrage. For him, the capitulation of ‘a completely bourgeois Parliament’ then, was the pattern for 1961. This theoretician blithely wiped out 69 years of history. nature of workers’ power or of the fundamental need for a Marxist leadership to make that power a possibility. When Mandel raised ‘structural reforms’ he embraced the programme of reformism, not of Trotskyism. But, important as it is, even this is wholly secondary to the question of leadership raised by Kemp. In 1953, the British Trotskyists accused Pablo and Mandel of cutting the heart out of the transitional programme, and reducing it to an empty cover for opportunism, by removing from it the struggle for revolutionary leadership against bureaucracy. In Belgium in the General Strike Mandel carried forward the desertion of that struggle for independent revolutionary Marxist leadership. There was a pay-off in the years following. As the trade union leaders deserted the Anglo-Russian Committee, so the Belgian lefts deserted Mandel. His opportunism took him into a campaign rotted in Walloon nationalism encouraged by the frustration of the defeat of the general strike. He was eventually expelled from the Socialist party after having been outmanoeuvred by the right wing and shorn of his left-wing friends. 1968 saw the great French General Strike—to date, the biggest strike in the history of capitalism. French capitalism, like that of Belgium in 1960 was faced sharply with the need to rationalise the economy and slash living standards. The crisis of world capitalism was sharpening monetary and trade rivalries. The Gaullist Government had made a series of attacks upon working class conditions. There was a high level of unemployment, particularly among young workers. Wages were pegged while prices and fares increased. Social security and education were attacked. De Gaulle ruled with slight concern for Parliament and with repressive police forces whose brutality was laid bare in the student demonstrations of early May and shocked the middle class. — were forced to move. They called for a one-day stoppage on May 13. Over 1 million workers and students marched in Paris. Sit-in strikes spread rapidly through the country. The Communist Party sought desperately to channelise the enormous movement away from any question of working class power. Ten million workers came out on strike. Large sections of the professional people and middle class were in sympathy. Farmers were in support. The government apparatus was paralysed. The government was on the brink of collapse. It was clear that de Gaulle could not have continued for 24 hours witbout the Communist Party to contain that vast movement. The Prime Minister negotiated with the trade union leaders while de Gaulle disappeared. There was class collaboration to turn the movement into economic channels. The government stopped the police brutalities while de Gaulle prepared a counter offensive. He consulted with his army chiefs and granted an amnesty to their right wing, near fascist, friends who had been in the Algerian conspiracy of 1951. He consulted with the Russian Ambassador. The latter discussions took place to gain a reassurance from the Soviet Government that they would be fundamentally opposed to revolution, even if de Gaulle had to use the troops. In the meantime the government offered concessions to the trade union leaders. Seguy, Stalinist leader of the CGT, presented the concessions to 25,000 workers in one of the occupied Renault factories. He was howled down. Trade union leaders went back to negotiate with the government. But the refusal of the Communist Party to make a decisive challenge for workers’ power meant the wave began to recede. Sure of Moscow and the CP de Gaulle threatened civil war. He called an election. The counter-revolution took the initiative. Right wing elements raised their heads again. The regime organised mass demonstrations. De Gaulle launched a virulent anti-communist campaign in which he accused the Communist Party of wanting the revolution which he knew very well they had protected him against. Eleven, socialist organisations were banned. The Communist Party welcomed the election. They called for negotiations on trade union demands to be split up industry by industry and called for workers to go back to work and avoid ‘embarrassing preparations for the election’. The de Gaulle regime which had reached the brink had its continuance ensured. The CP knew very well that if by chance at all they had won a majority de Gaulle would dissolve Parliament. The election was a Bonapartist referendum. It could have no other result but victory for the Gaullists. The history of Stalinism in the French General Strike was once again a history of counter-revolution. As for the revisionist Mandel, he, performing on the barricades in Paris, equalled his ‘triumph’ seven years before in Belgium. For a man who reads and writes so much he learns very little. In fact, the student revolt could only mean anything insofar as it was harnessed to that struggle. It was an inchoate, spontaneous protest with a semi-anarchist leadership that made a virtue of action as such. The Pabloites sank into that leadership without a Marxist principle to be seen. Anyone who confuses a student forum with a workers’ soviet is beyond redemption! There was certainly no lack of heroism in the student movement. The issues, however, is not heroic deeds but organising a turn of students to workers and defeating the sterile haranguing against I authority as such. The Pabloites and other leaders led the students (or more correctly, went along with the spontaneous movement) to set up barricades in the student quarter, which immobilized the students, surrounded by the police. The FER — the OCI(9) student organisation - correctly stressed the need to take the student struggle into the working class. On the night of the barricades they raised the principal task of going out to bring 500,000 workers from the suburbs into the student quarter for protection. The chief accusation which the Fourth International advances against the traditional organisations of the proletariat is the fact that they do not wish to tear themselves away form the political semi-corpse of the bourgeoisie Under these conditions the demand systematically addressed to the old leadership: ‘Break with the bourgeoisie, take the power!’ is an extremely important weapon for exposing the treacherous character of the parties and organisations of the Second, Third, and Amsterdam Internationals. Thus the struggle to link students with workers was not to further the fight for revolutionary leadership in the working class. That was liquidated into spontaneity. Their position was identical with the simplistic syndicalism of the SWP here. The task becomes just to extend the struggle of the working class, give them a correct organisational pattern and somehow the question of leadership will be resolved. This is nothing but a capitulation to the bureaucracy; a refusal to struggle against it. The way the Central Strike Committee was posed was an evasion of the real central political duty. It gave illusions that the working class could proceed to power irrespective of leadership, provided they had the correct set-up. Thus the OCI was in the same stream as Mandel in the Belgian General Strike. Britain is now once again in a period of great class struggle. In the light of the world economic collapse and the extreme decay of British imperialism, it is inevitable that a struggle of greater depth should now be posed in Britain. What are the preparations of the leaders of the working class for such a struggle? That question can be answered briefly and with certainty. Nil! This applies to leaders of the trade unions and Labour Party of right or left variety. More than that, insofar as they are compelled against their will to take a glimpse at the future, they are mortally afraid of its consequences. The treacherous way in which the General Council refused to assist the steelworkers and, indeed, kept a discussion of their struggle off the agenda of its meetings, clearly shows its fear of widening struggle. How correctly Trotsky characterised the trade union bureaucracy in 1927: ‘It is not just a question of trade unions in opposition to the state, for the state rests on the trade union bureaucracy.’ In other words, the trade union bureaucracy, particularly in a period of crisis, acts for the ruling class, its state and its government. Compelled to take the leadership in protest, it will do so only to betray. So the leadership of the General Council prepares for the general strike by preparing for another betrayal. Never Again’ said trade union leaders after 1926. And since that day, ‘Never Again’ has remained burned into the consciousness of the trade union bureaucracy. We have seen that the right wing bureaucracy prepares to betray as in 1926. What of the ‘lefts’? The left reformists and revisionists would have workers believe that their most decisive experience will be another Labour government. Insofar as the Bevanites see any general strike at all it is as a protest movement perhaps pushing the Tory government back or leading it to resign. Heffer himself has already told us in his book Class Struggle in parliament that he believes in socialism through the Parliamentary Labour Party. If the decisive struggles are in parliament then mass struggles outside can only be an adjunct. Therefore it is impossible to see the decisive and central importance of preparations for the general strike. The ‘Militant’ group clings to the heels of Benn and Heffer. Their entryism long since ceased to be a tactic even in verbal acceptance. They now move more openly to the right as the crisis sharpens. They are for introducing socialism through the Labour Party and the hopes and desire of workers are directed by them to the next Labour government. Again, the general strike — and they call for a one-day general strike! — is an adjunct to a parliamentary shift. Together with the Stalinists and left reformists they are directed towards a parliamentary road to socialism. The most dangerous illusion today is that a mass protest can frighten the enemy. There is no possibility of this government resigning like the Heath government, If it did so, then, this time it would be to make way for a military coup such as was advocated by army officers in 1974. On the other hand, a Labour government could only come into office during mass struggle as a Kerensky government facing Councils of Action challenging for power. There is a new stage in the development of the working class. A preparation, not just for new bouts of militancy posing new rank-and-fileism, problems of simple assistance to one another in struggle; but a preparation for political struggles, a preparation of struggles for power with great conflicts for revolutionary leadership in the unions. Of course, there are a number of left talkers to tell workers that their fight must be a political one. Left parliamentarians can hardly say anything else in today’s circumstances. But politics to them means that the solution lies on the Labour parliamentary plane. In fact, this means they take the real political questions out of the unions. They have no intention, and never had any intention of organising a fight for a principled trade union leadership. They are at one with the right wing leadership of the unions in their abhorrence of wholesale mass struggle. They preserved a noticeable silence in relation to the demand ‘Make the TUC fight’ right through the betrayals of the General Council in the steel strike. Here is the arena of the fight for leadership, here, the central experience of the working class. We say ‘Make the TUC fight the Tories’ in order to expose them to the masses. This will open the way to changing the leadership of the unions to more genuine representatives of their embattled membership. What faces the working class is a political struggle in which the central question is the struggle for power. But there is not a trade union leader or parliamentary left leader in Britain who wants to put this issue to his members and rally them. Thus the Political Committee of the Workers Revolutionary Party put the issue very clearly on February 10. The essence of revisionist desertion of Marxism is the denial of the dialectical interrelation of leadership and working class. That is what is involved in all brands of revisionist antagonism to the WRP and revolutionary leadership — its unseriousness on security problems; its violent opposition to the Workers Revolutionary Party exposure of agents in the Trotskyist movement; the Socialist Workers Party’s (SWP) cynicism on revolutionary ‘elitism’ and its use of rank-and-fileism as a diversion from the question of trade union leadership; the cuddling up of the SWP to the CP and the International Marxist Group (IMG) to the SWP; the references of revisionists to themselves as streams in what is called the ‘revolutionary left’. So the revisionists will see only a quantitative development in the working class; an increase in consciousness for them is directly related to strike statistics. So they will draw pessimistic conclusions as strike statistics show a drop between the first years of the l970s and the latter half. ‘The class struggle is harder’ says one contributor to the SWP’s International Socialism, or the ‘relationship of forces has moved against the working class’ says Cliff the SWP leader. Certainly the class struggle is getting harder for syndicalism. Workers have grown more wary of isolated action and more sure that less and less is accomplished by protest. But only those impressionists who start from their own reactions and fears can conclude that workers have become less combative. Workers feel that every question now poses going all the way and they look to their organisations but with an intense distrust of the leadership which could mobilise them. They feel the need for a complete change of leadership. That means a big leap for themselves. When workers see great political questions posed and are girding their loins for a great leap, the revisionists see only a reversion in the labour movement. Could a general strike be successful? Certainly! But only if it leads to workers power, if Councils of Action or such organisations embracing the working class become the basis of a workers’ government. Success means a revolutionary Marxist leadership. The task posed, therefore, is the building of a mass WRP with deep roots in the unions. Communism today is represented only by the WRP. The growth of communist leadership in the unions is as decisive as when Trotsky wrote in 1926. The most powerful force of the British working class, undefeated for decades, is being compelled into the most decisive battles. With a real communist leadership it is invincible. Without it, there can only be defeats. The rich history of the general strike in theory and practice points incontestably to the need for such a leadership which means building the Workers Revolutionary Party. 1. 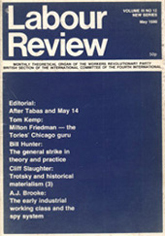 The ILP and the Fourth International Trotsky’s Writings on Britain. 3. See:‘Early Years of the British Communist Party’ by Brian Pearce. Who quotes the illusions of party leaders in the ‘lefts’, in Essays in the History of Communism in Britain, New Park Publications, 1975. 9. Organisation Communista Internationaliste. The OCI split with the International Committee in 1971. It denounced the IC’s concentration on the training of the youth in dialectical materialism. They later developed the anti-Leninist conception that the revolutionary consciousnesses of workers is a spontaneous product of their struggle. Their practice in 1968 was in line with this. 10. See: A Reply to the British Agents of the OCI liquidationists, Michael Banda and Peter Jeffries. 11. ILP and the Fourth International, ibid.